30.07.2010: Buoyed by his podium performance in Bulgaria, Solberg holds Thursday's overnight lead Petter Solberg moved into an early lead of the 2010 Neste Oil Rally Finland after setting the fastest time on Thursday evening’s opening stage. 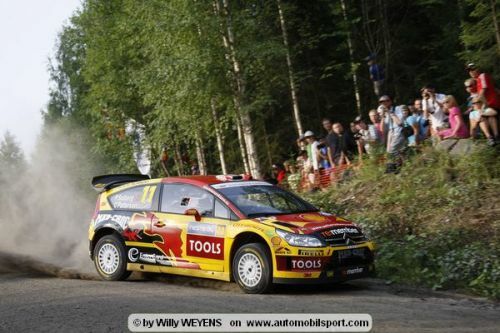 Petter Solberg moved into an early lead of the 2010 Neste Oil Rally Finland after setting the fastest time on Thursday evening’s opening stage. The Citroen C4 WRC driver completed the short Laajavuori sprint stage in 2min 33.2sec, exactly one second quicker than his nearest rival, Ford team-leader Mikko Hirvonen. Hirvonen, who won Rally Finland last year, also claimed to have more speed in reserve. “It was quite a steady start, and I made a few small mistakes, but I think we’re in the game now. We’ll see for sure tomorrow morning,” said the Finn. Sebastien Loeb and Jari-Matti Latvala will start Friday’s competition tied in third place after both completing in 2min 34.8sec - 1.6sec slower than Solberg. Sebastien Ogier rounded off the top five times, on his first competitive outing driving for the Citroen Total team. Neste Oil Rally Finland resumes on Friday morning, with the first stage - the 12.75km Urria - getting underway at 0742hrs. Red Bull Rally Team went for the superlatives in Finland!